Marin Lipowitz has always been interested in and passionate about experiential learning. She founded Learning By Handz with the intent of increasing the awareness and availability of a hands-on, arts-based approach to education. The Learning By Handz’ vision and mission is to develop and produce curriculum kits in a wide variety of subjects. Math By Hand, for grades 1-4, is the first completed set in this series. Marin holds a Masters Degree in Waldorf Education, and a California teaching credential in art. She’s had years of experience as a Waldorf class teacher in the early grades, has taught hands-on science and math to homeschoolers in grades 1-6, and served K-12 students and their families as an educational facilitator and independent studies teacher in several California public charter schools. The exciting and innovative approach found in Marin’s methods and materials reflect her experience with the creative and academic gifts Waldorf Education offers, along with an in-depth and practical knowledge of state and national education standards. 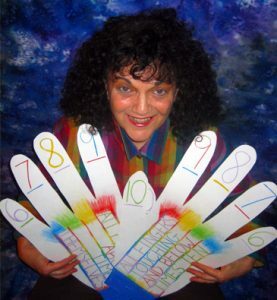 The Math by Hand kits are a wonderful introduction to a new and lively way to teach and learn!